Today, Oracle is presenting a webcast describing their strategy for the company going forward after the Sun acquisition. In the first 20 minutes there was much discussion about delivering integrated systems: applications + database + OS + hardware. This is a tremendous value proposition. It is such a tremendous value proposition that it could have been taken from the slides we put together 8 years ago in Sun's Integrated Systems Engineering group. We had difficulties with the business of delivering such integrated solutions. Sure, there were a few technical difficulties, but working together with the different engineering groups at Sun and Oracle, we were able to deliver a good technical solution. However, the business challenges of working across different product groups and companies were insurmountable at the time. In the end, the Integrated Systems Engineering group was disbanded and the products were EOLed. In my position as Chief Architect for the Integrated Systems Engineering group, I had the pleasure of working with many talented engineers and product marketing teams. But the experience taught me that very good technical solutions may not be successful because of the rest of the business activities needed to ensure the right products offering the right value are delivered at the right time to the right market. And those products include much more than a what a systems engineering team can integrate in a lab. This is why I entered the EMBA program at USC's Marshall School of Business. I already knew how to integrate complex systems and make them simple to install and manage. But I did not know how to take such a product and make it successful in the market. I'm a lot smarter now. I wish Oracle well in their future endeavors. The value proposition is good. The need exists. The challenges are difficult. If they can overcome the non-technical barriers, the future looks bright. If you wander through the OpenSolarisZFS-discuss archives or look at the ZFS Best Practices Guide, then you can encounter references and debates about whether the zfs send and zfs receive commands are suitable for backups. As I've described before, zfs send and zfs receive can be part of a comprehensive backup strategy for high-transaction environments. But people get nervous when we discuss placing a zfs send stream on persistent storage. The reasoning is that if the stream gets corrupted, then it is useless. There is an RFE open to improve the robustness of zfs receive, but that is little consolation for someone who has lost data. 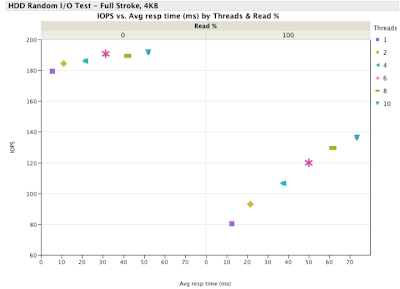 This post is the first in a series looking at the use and misuse of IOPS for storage system performance analysis or specification. JRS Systems blogs about ZFS copies at http://jrs-s.net/2016/05/09/testing-copies-equals-n-resiliency/ I tried to reply there, but the website wouldn't accept my reply, complaining about cookies and contact the site administrator. So I'll reply here. Internet Hurrah! For a single device pool, copies=2 places the redundant copies approximately 1/3 (copies=2) and 2/3 (copies=3) into the LBA range of the single device. Assuming devices allocate with some diversity by LBA, this allows recovery from a range of LBA failures. For HDDs, think head-contacts-media type of failures. For a random failure case, you get random failures.